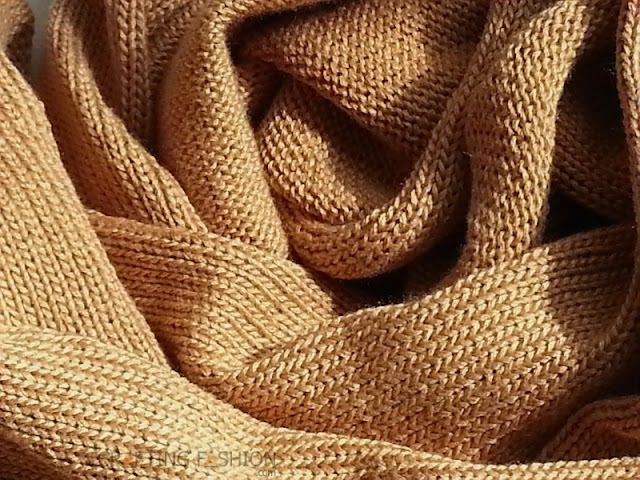 Often, sewists who like my sweater knit fabric designs say, "I love your fabric but I wouldn't know what to do with it." After asking them a couple of questions, I direct them to specific places on this site, which I hope gives them enough information to put them at ease and get them started happily working with sweater knits. With my widths running anywhere between 18 inches and 36 inches, yardage requirements will vary. Generally, it's good to allow about 2 1/4 yards of main fabric with another 1/2 yard for bands or binding for a woman's long sleeve "medium" sweater. Plain jersey, 100% bamboo, click for more info. So what about commercially available patterns will make them work? First of all, the pattern should be designed specifically for knits. Secondly, it should be a pattern with a basic design -- nothing too fancy. 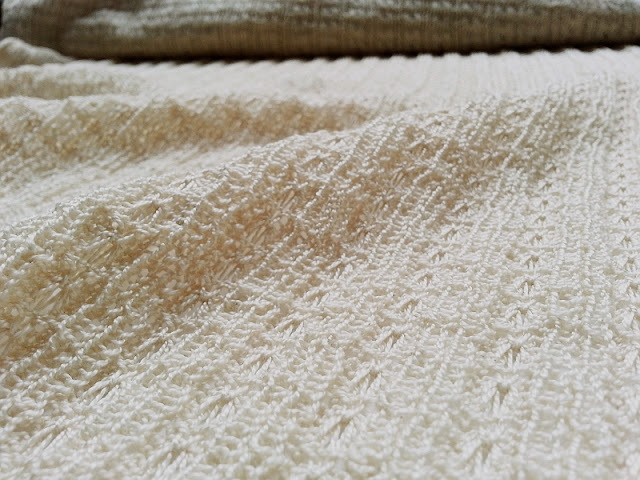 Though leaving an edge unfinished may be an option for a lighter weight knit, it's not an option for a sweater knit fabric, which can and will fray or run. Bands, bindings or hems are required. Inside seams should be serged or zigzagged. Here's one basic patterns with lots of potential. If you're comfortable with adding your own seam allowances, this classic tube neck sweater pattern from BurdaStyle is an excellent candidate. Though the recommended fabric is "fine stretch jersey", the ease in the styled photo on the BurdaStyle site suggests to me that it would also work for a heavier jersey, like the sweater weight bamboo in the top photo. The width of my bamboo jersey would only work up to a Burda size 42. The bamboo would look lovely finished with twin needle hemming as instructed in the pattern. My Moonstone lacy rib, which I originally used for the Moonstone Sweater would be an unconventional, but very suitable choice, since this rib fabric is light and airy. Unlike with the Moonstone Sweater, I would the use fabric in the traditional way with the greatest stretch going horizontally. This means the stripes would run vertically on this sweater. This fabric is wide enough for all given sizes of BurdaStyle #121A. Moonstone lacy rib, 100% pearl cotton, click for more info. 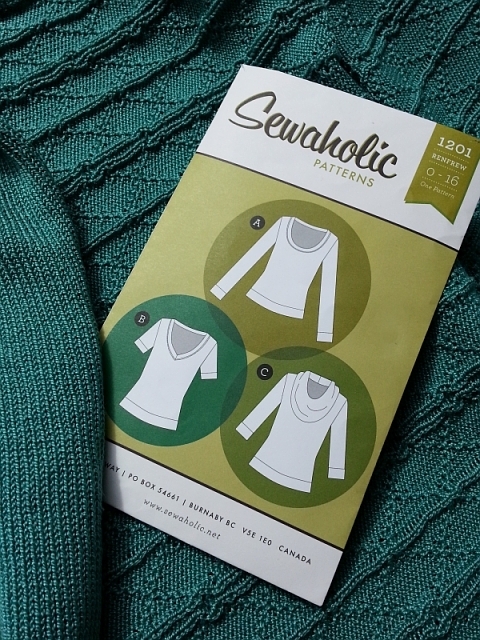 The Renfrew Top, from indie Sewaholic, is a very popular pattern and an excellent candidate for a sweater knit fabric. 1201 Renfrew Top, this could happen. 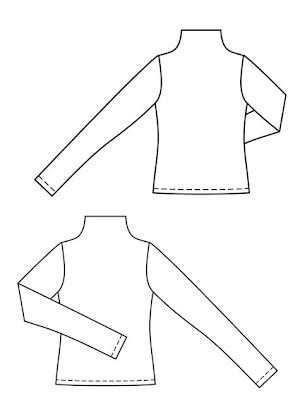 Again, the cutting layout would need to be modified to accommodate a narrow fabric. And I would choose to make the bands, which are doubled, out of a thinner fabric than the main fabric, much the way I did with the Providence Sweater. If I were using a very heavy sweater knit, I would go up a size for comfort when layering. Images not generated by O! Jolly! remain the property of their respective owners and are used here for the purposes of education, comment and review.